Guest Lecture on SOFTWARE CAREER GUIDANCE on 4th January, 2019 at 10.00 a.m. in Thiruvalluvar Arangam by Mr.Navaneethakumar Murugesan, Bilingual Technical Analyst, Hexaware Technologies Limited, Tokyo, Japan. 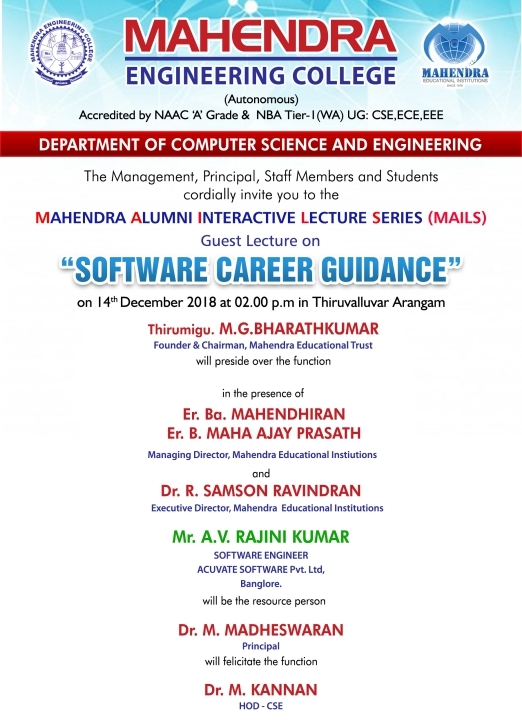 Guest Lecture on SOFTWARE CAREER GUIDANCE on 14th December, 2018 at 2.00 p.m. in Thiruvalluvar Arangam by Mr.Rajini Kumar, Software Engineer, Acuvate Software Pvt. Ltd., Bangalore. Guest Lecture on OVERVIEW OF RECENT TECHNOLOGIES on 26th September, 2018 at 10.00 a.m. in TLC-6 by Mr.R.Ranjithkumar, Software Developer, Vedha Technologies, Chennai. 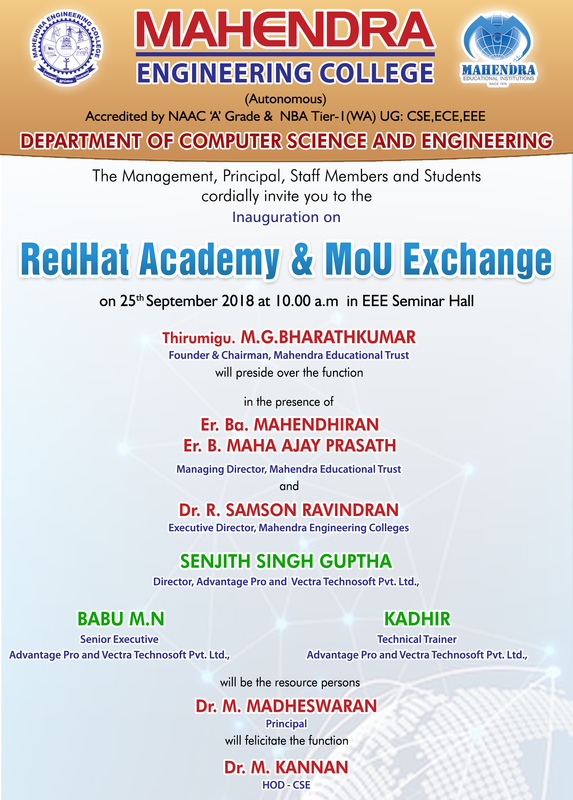 REDHAT Linux Using AWS by Mr.R.Rajkumar, Network Engineer, Vectone India Private Limited, Chennai on 14th September, 2018 at 1.45pm. 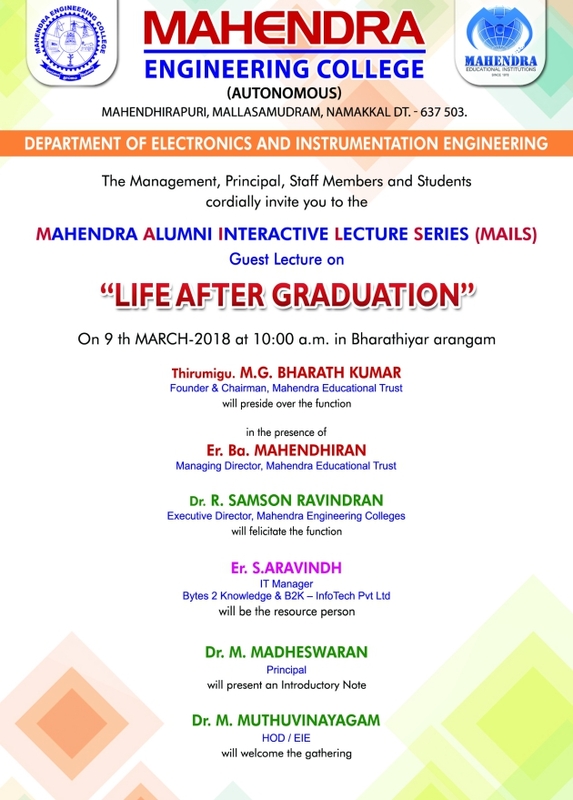 You are cordially invited to the Guest lecture organized by Life After Graduation by Er. S. Aravindh, IT Manager, Bytes 2 Knowledge & B2K-Infotech(P) Ltd on 9th March 2018 at 10 a.m. 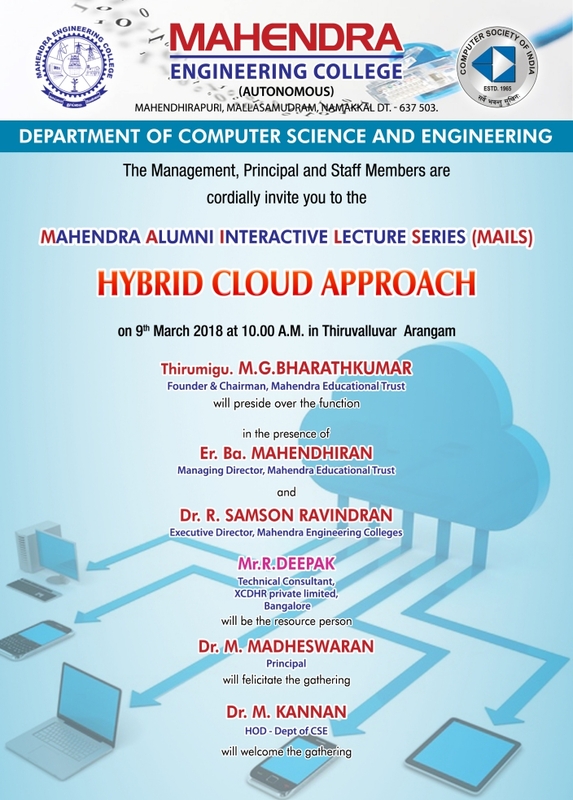 Hybrid Cloud Approach Lecture by Mr.R.Deepak, Technical Consultant, XCDHR private Limited, Bangalore on 9th March, 2018 at 10 a.m. Managerial Skills of Entrepreneur Lecture by Er.B.Sindhujaa, General Manager, Hello Mobiles, Shevvapet, Salem will be the resource person. THE WAY OF ART IN INTERIOR AND EXTERIOR DESIGNS on February 21, 2017 at 12 pm in Civil Seminar hall. Mr.E.V.Mohana Manikandan, Designer, Design Intend, Hosur will be the resource person. 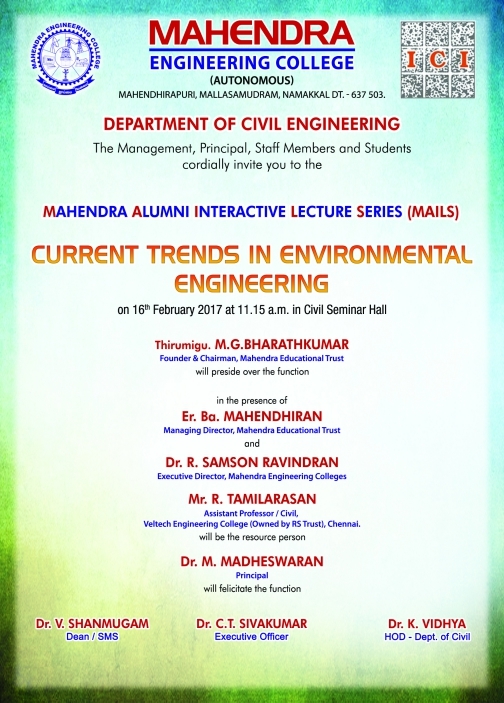 Lecture on Current Trends in Environmental Engineering on 16th February, 2017 at 11.15 a.m. in Civil Seminar hall. Mr.R.Tamilarasan, Assistant Professor/Civil, Veltech Engineering College, Chennai will be the resource person. 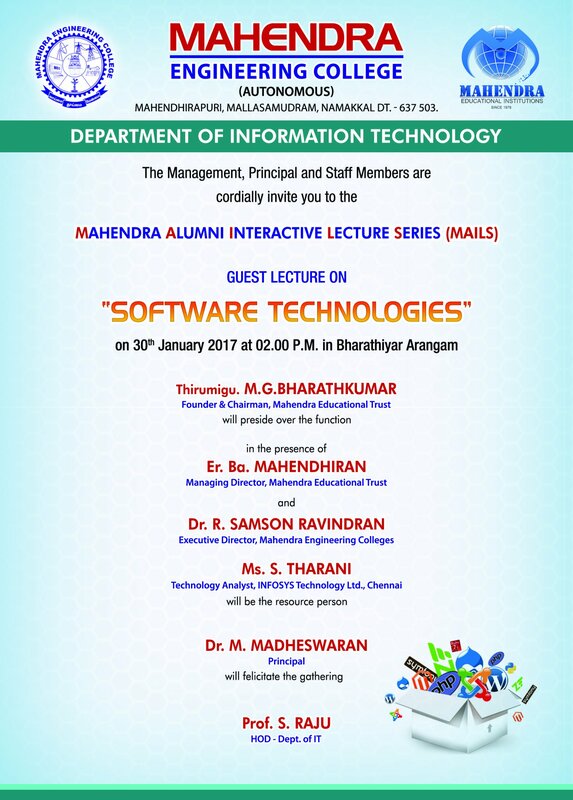 Guest Lecture on SOFTWARE TECHNOLOGIES on 30th January 2017 at 2.00 PM in Bharathiyar Arangam. Ms.S.Tharani, Technology Analyst, Infosys Technology Ltd., Chennai will be the resource person. 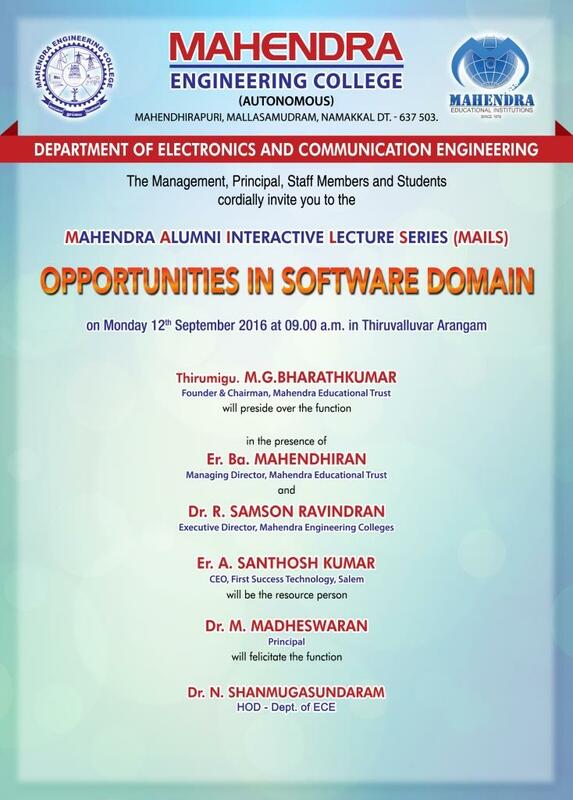 Lecture on OPPORTUNITIES IN SOFTWARE DOMAIN on Monday 12th September, 2016 at 09.00 a.m. in Thiruvalluvar Arangam. Er.A.Santhosh Kumar, CEO, First Success Technology, Salem will be the resource person. 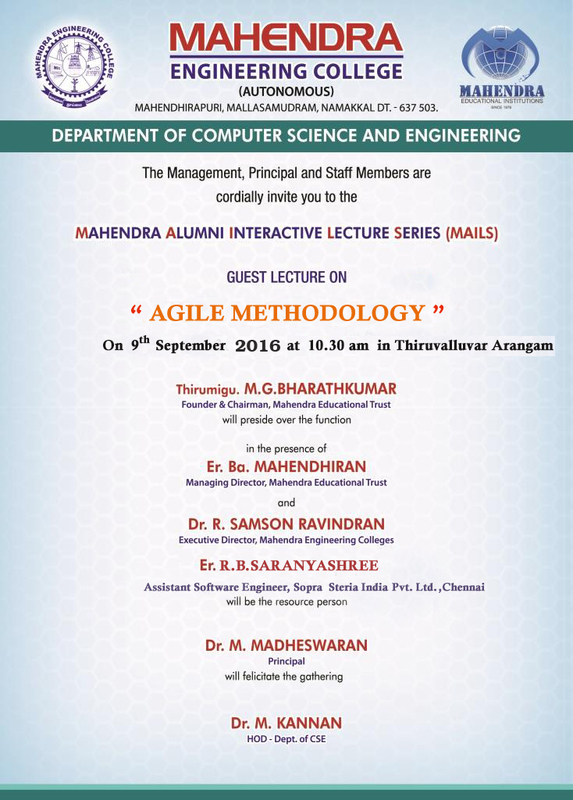 Guest Lecture on AGILE METHODOLOGY on 9th September, 2016 at 10.30 a.m. in Thiruvalluvar Arangam. Er.R.B.Saranashree, Assistant Software Engineer, Sopra Steria India Pvt. Ltd., Chennai will be the resource person. 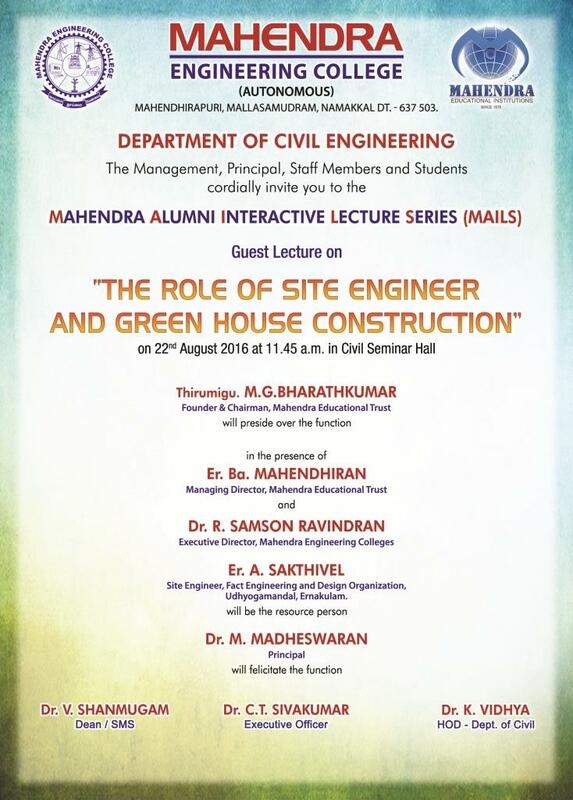 Guest Lecture on THE ROLE OF SITE ENGINEER AND GREEN HOUSE CONSTRUCTION on 22nd August, 2016 at 11:45 a.m. in Civil Department Seminar Hall. Er.A.Sakthivel, Site Engineer, Fact Engineering and Design Organization, Udhyogamandal, Ernakulam will be the resource person. 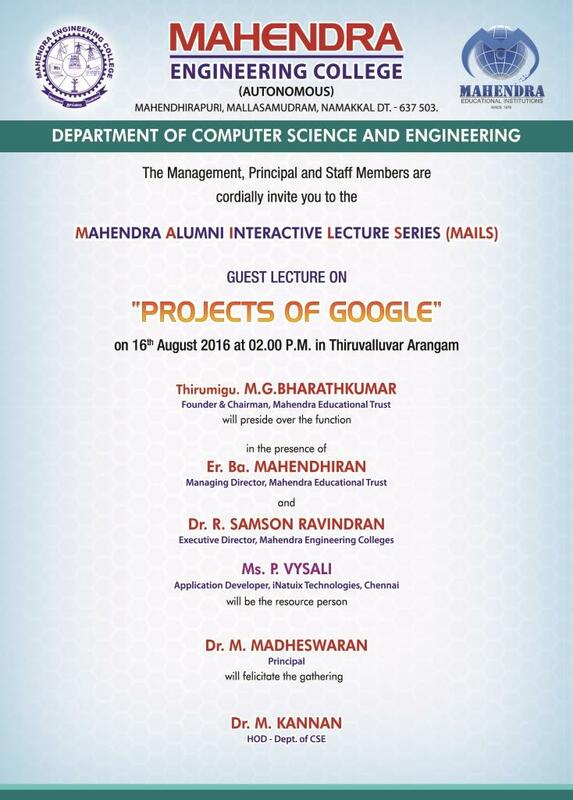 Guest Lecture on PROJECTS OF GOOGLE on 16th August, 2016 at 2:00 pm in Thiruvalluvar Arangam. Ms.P.Vysali, Application Developer, iNautix Technologies, Chennai will be the resource person. 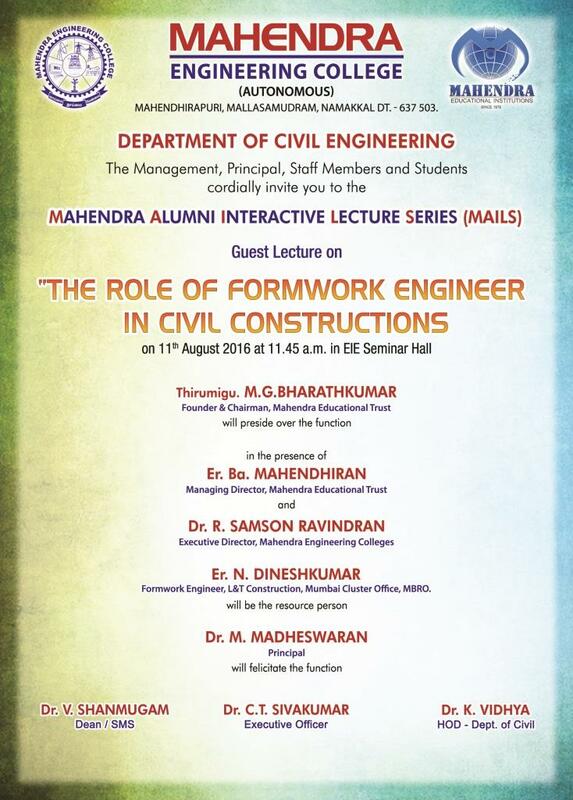 Guest Lecture on THE ROLE OF FORMWORK ENGINEER IN CIVIL CONSTRUCTIONS on 11th August, 2016 at 11.45 a.m. in EIE Seminar Hall. Er.N.Dineshkumar, Formwork Engineer, L&T Construction, Mumbai Cluster Office, MBRO will be the resource person. 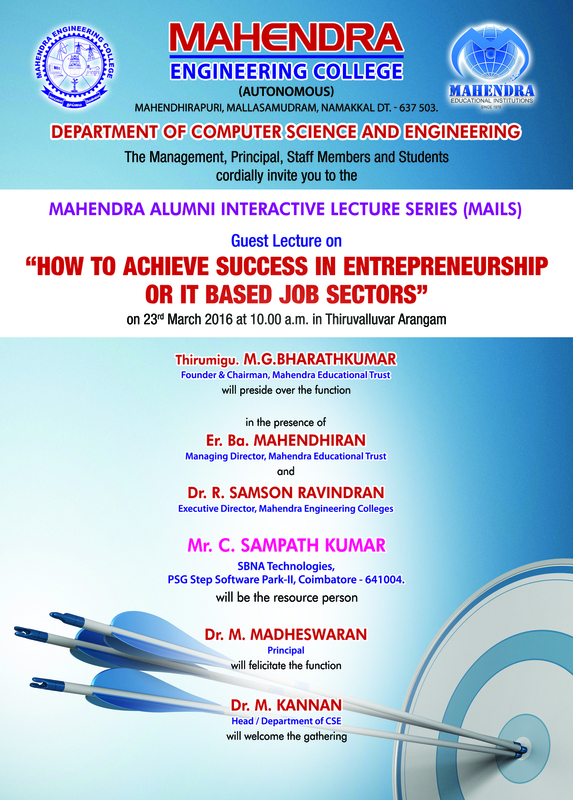 Guest Lecture on HOW TO ACHIEVE SUCCESS IN ENTREPRENEURSHIP OR IT BASED JOB SECTORS on 23rd March 2016 at 10.00 a.m. in Thiruvalluvar Arangam. Mr.C.Sampath Kumar, Director - Sales, SBNA Technologies, PSG STEP Software Park-4, Coimbatore will be the resource person. 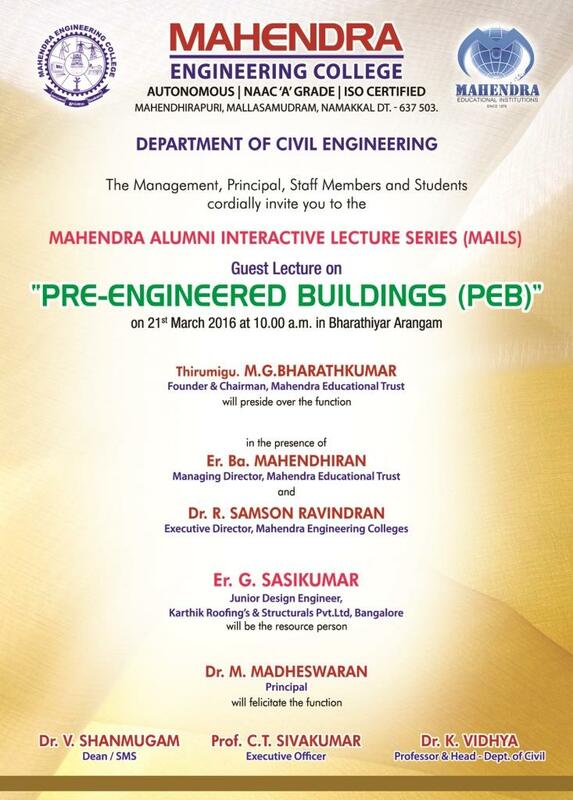 Guest Lecture on PRE-ENGINEERED BUILDINGS (PEB) on 21st March 2016 at 10.00 a.m. in Bharathiyar Arangam. Er.G.Sasikumar, Junior Design Engineer, Karthik Roofings & Structurals Pvt. Ltd., Bangalore will be the resource person. 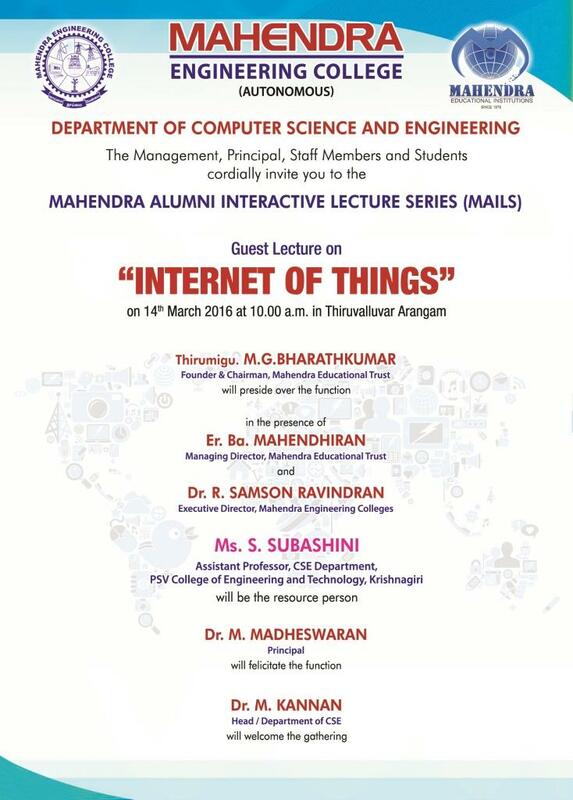 Guest Lecture on INTERNET OF THINGS on 14th March, 2016 at 10.00 a.m. in Thiruvalluvar Arangam. Ms.S.Subashini, Assistant Professor, CSE Department, PSV College of Engineering and Technology, Krishnagiri will be the resource person. 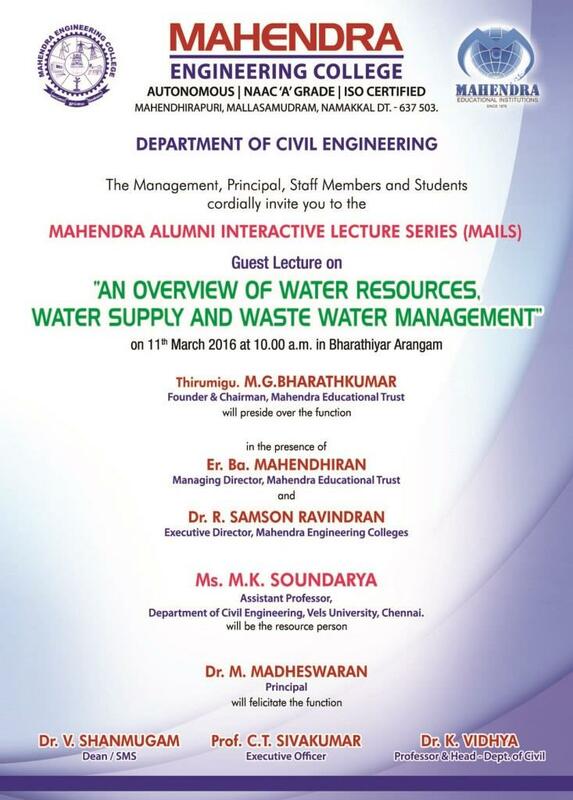 Guest Lecture on AN OVERVIEW OF WATER RESOURCES, WATER SUPPLY AND WASTE WATER MANAGEMENT on 11th March, 2016 at 10.00 a.m. in Bharathiyar Arangam. 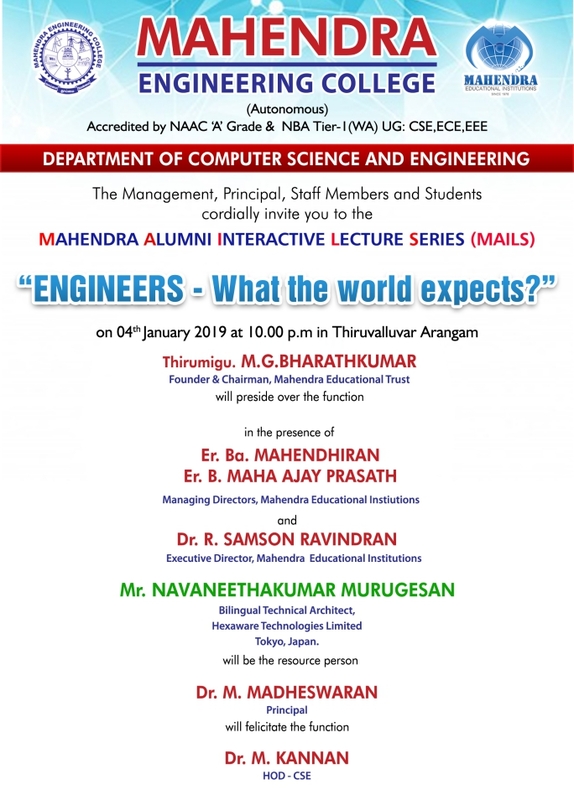 Mr.M.K.Soundarya, Assistant Professor, Department of Civil Engineering, Vels University, Chennai will be the resource person. 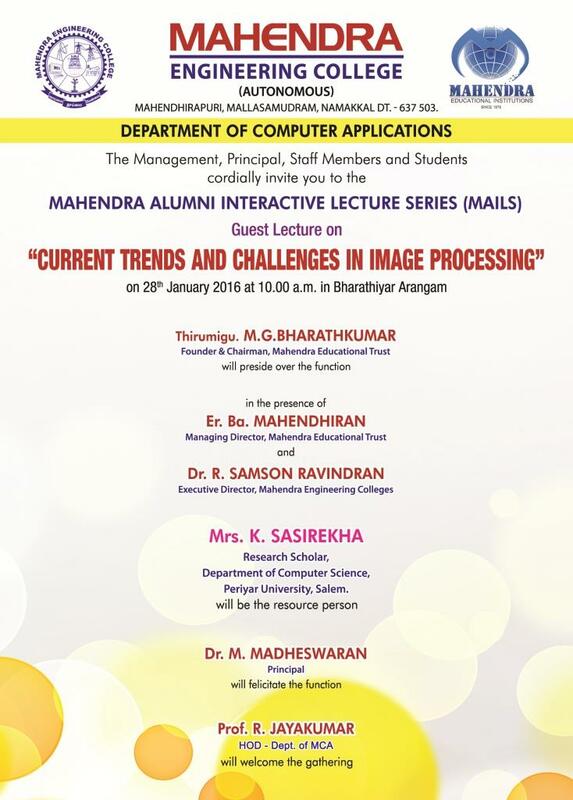 Guest Lecture on CURRENT TRENDS AND CHALLENGES IN IMAGE PROCESSING on 28th January, 2016 at 10.00 a.m. in Bharathiyar Arangam. Mrs.K.Sasirekha, Research Scholar, Department of Computer Science, Periyar University, Salem will be the resource person. 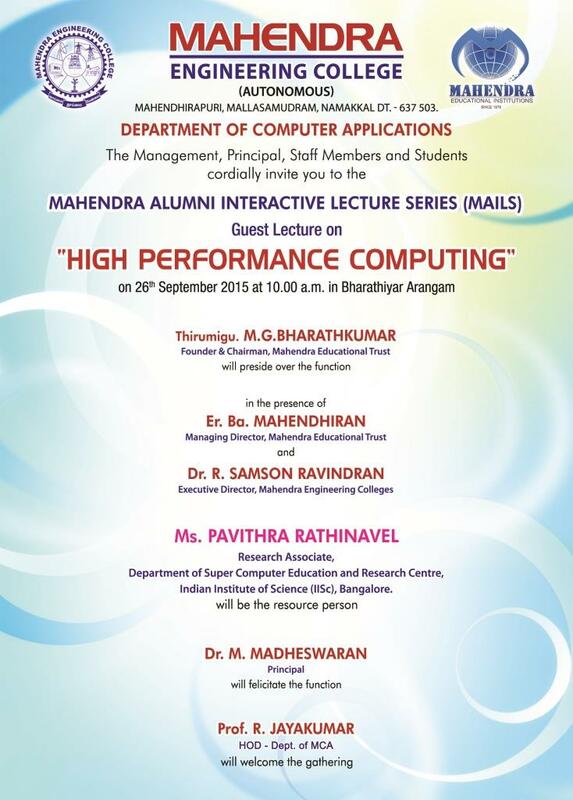 Guest Lecture on "HIGH PERFORMANCE COMPUTING" on 26th September, 2015 at 10.00 a.m. in Bharathiyar Arangam. Ms.Pavithra Rathinavel, Research Scholar, Department of Super Computer Education and Research Centre, Indian Institute of Science (IISc), Bangalore will be the resource person. 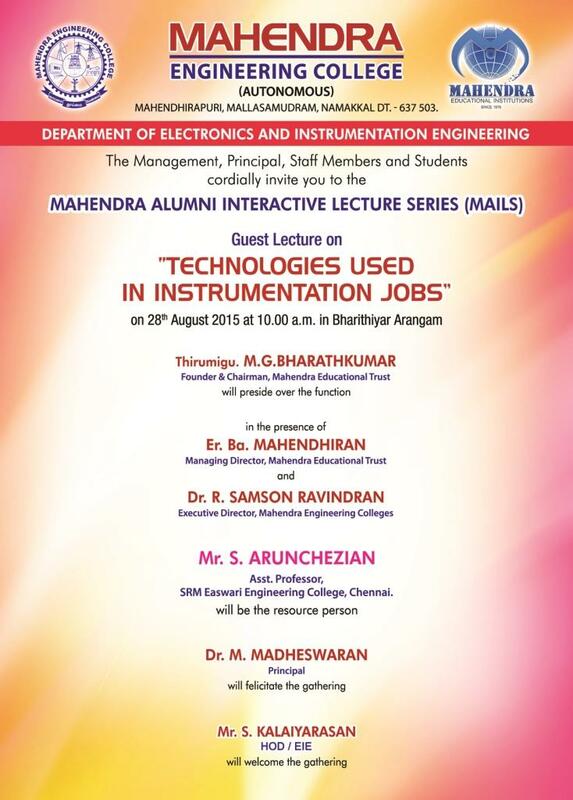 Guest Lecture on "TECHNOLOGIES USED IN INSTRUMENTATION JOBS" on 28th August, 2015 at 10.00 a.m., in Bharathiyar Arangam. Mr.S.Arunchezian, Asst. Professor, SRM Easwari Engineering College, Chennai, will be the resource person. 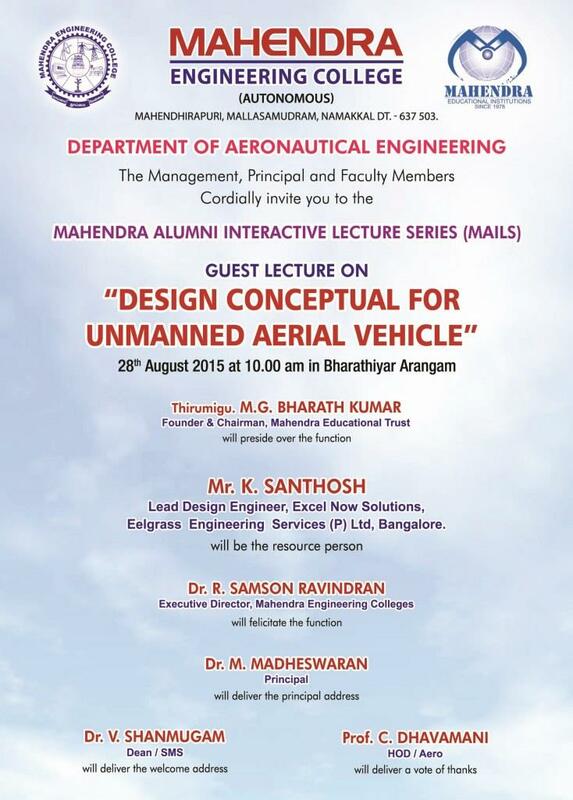 Guest Lecture on "DESIGN CONCEPTUAL FOR UNMANNED AERIAL VEHICLE" on 28th August, 2015 at 10.00 a.m. in Bharathiyar Arangam. Mr.K.Santhosh, Lead Design Engineer, Excel Now Solutions, Eelgrass Engineering Services(P)Ltd., Bangalore will be the resource person. 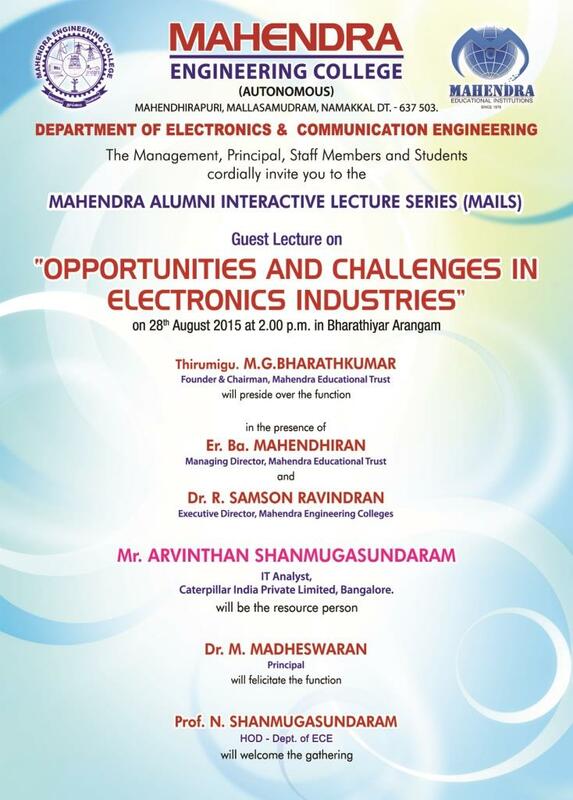 Guest Lecture on "OPPORTUNITIES AND CHALLENGES IN ELECTRONICS INDUSTRIES" on 28th August, 2015 at 2.00 p.m. in Bharathiyar Arangam. Mr.Arvinthan Shanmugasundaram, IT Analyst, Coterpiller India Private Limited, Bangalore will be the resource person. 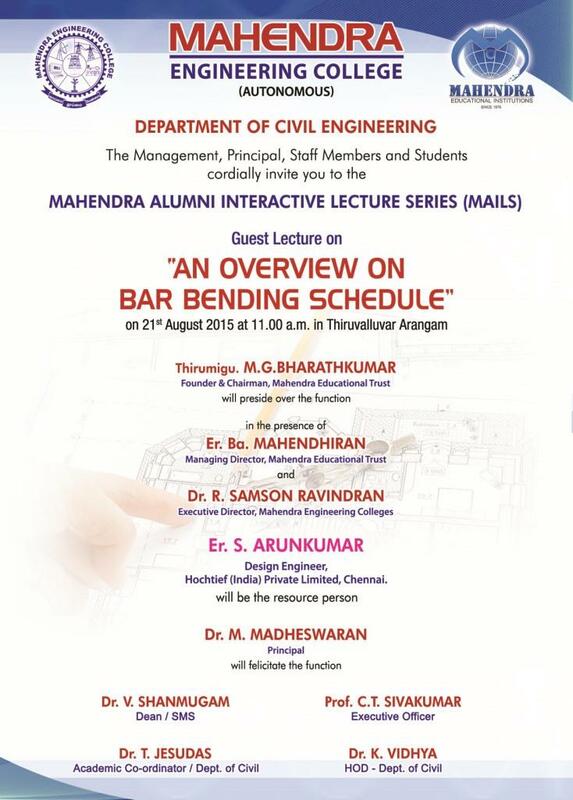 Guest Lecture on "AN OVERVIEW ON BAR BENDING SCHEDULE" on 21st August, 2015 at 11.00 a.m. in Thiruvalluvar Arangam. Er.S.Arunkumar, Design Engineer, Hochtief (India) Private Limited, Chennai will be the resource person. 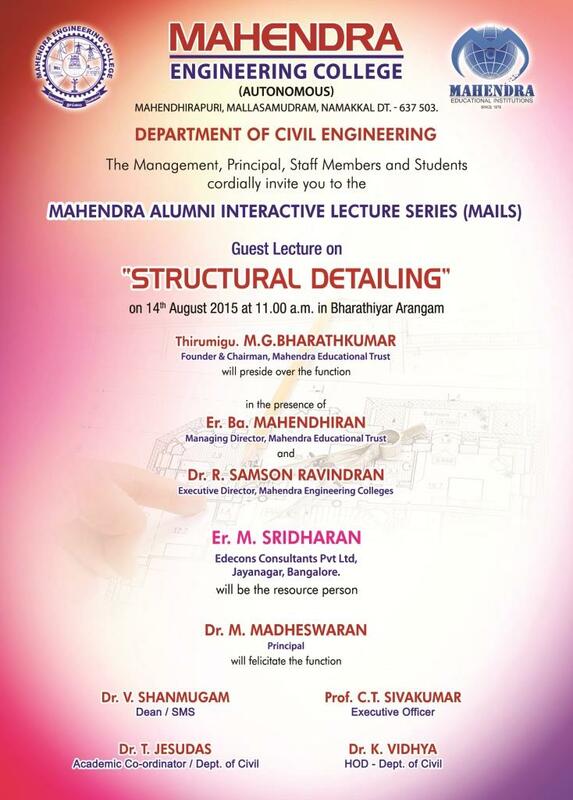 Guest Lecture on "STRUCTURAL DETAILING" on 14th August, 2015 at 11.00 a.m. in Bharathiyar Arangam. Er.M.Sridharan, Edecons Consultants Pvt. Ltd., Jayanagar, Bangalore will be the resource person. 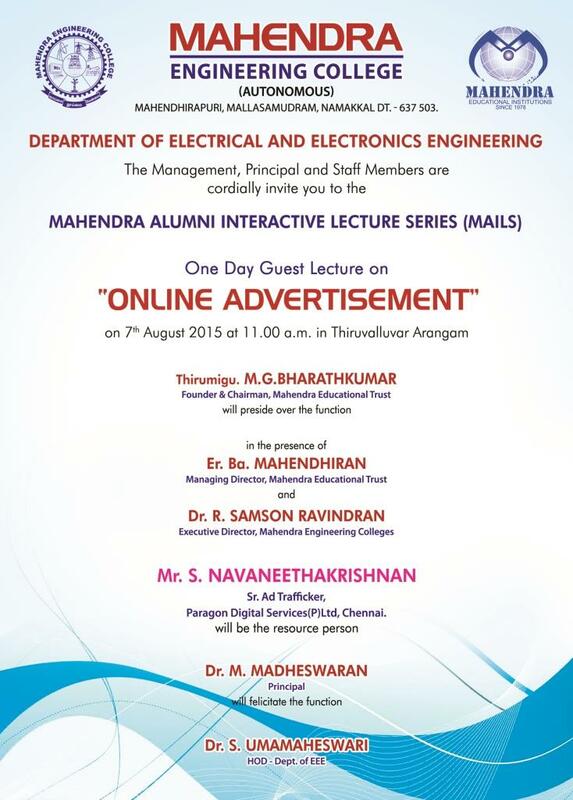 One Day Guest Lecture on "ONELINE ADVERTISEMENT" on 7th August 2015 at 11.00 a.m. in Thiruvalluvar Arangam. Mr.S.Navaneethakrishnan, Sr.Ad Trafficker, Paragon Digital Services(P)Ltd., Chennai will be the resource person. Dear Alumni, Please contact Prof.S.Raju (8760294969)or alumni@mahendra.info, if any information is needed regarding the meet.